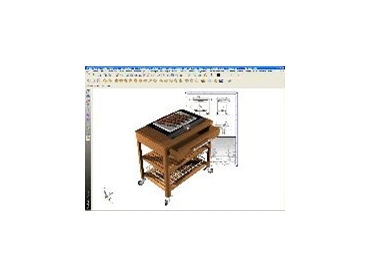 MISSLER Software has launched the 2006 version of TopSolid'Wood and TopSolid'WoodCam. Available from CIM Solutions , TopSolid'Wood is currently used by more than 400 companies around the world in areas such as interior design, furniture making, point of sale furnishings, outdoor furnishings, furnishings for boats, aircraft, cars, etc. Officially launched in France in 2003 and on the international market in May 2005, TopSolid'Wood and TopSolid'WoodCam have had a huge success in just a couple of years. With a 45% increase in domestic sales compared to 2005, Missler Software is optimistic that its integrated CAD/CAM solution for the wood industry will become the reference solution for this industry over the coming years. * Machining of imbricated parts. The program’s new material configurator enables operators to change material and coatings on more than one part at a time and with different selection options. The speedy definition of a complete panel where all data is recuperated in the BOM will be possible with the new function "Entity Panel" - two new interfaces will also be added to the module to complete the existing interfaces available: Xilog for SCM machining centers and ProfiCoupe for the optimisation of Homag cutting. TopSolid'WoodCam 2006 will also offer important evolutions, notably multi-draft machining, which permits the automatic generation of machining documents for all selected assembly parts. The generation of more than one ISO code at a time is also possible with TopSolid'WoodCam. TopSolid'WoodCam 2006 will also be enriched with a complex imbrication module for the machining of a group of parts positioned either manually or automatically in the stock.